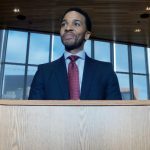 Netflix/Peter Andrews(NEW YORK) — André Holland had one burning question on his mind when he approached his new Netflix sports-drama, High Flying Bird. The actor, who also serves as an executive producer on the film, plays Ray, a sports agent who has a bold solution during an NBA lockout. Holland tells ABC Radio his intention was to explore the idea of black ownership and what it would mean if black athletes took back the sport they made so popular. “I think the big question that we asked ourselves is, ‘What would it be like if all the black players in the NBA got together and said, ‘You know what, we’re going to start our own league’?” says Holland. Holland also says the film is a response to the rhetoric aimed at NFL players who take a knee in protest of unarmed black shootings. Holland says High Flying Bird has been a long time coming. High Flying Bird, also staring Zazie Beetz, is now available.